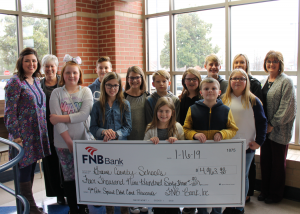 January 2, 2019 (Mayfield, KY) FNB Bank is proud to announce that they have donated over $66,000 back to Mayfield, Graves County and Trigg County Schools through their Spirit Debit Card Program. 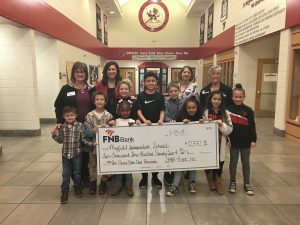 These donations to the school systems are a result of FNB’s 2018 Spirit Debit Card Reward Program. The FNB Spirit Debit Card Rewards Program allows FNB and their customers the opportunity to give back to their local schools when they use their FNB debit card. FNB currently offers Spirit Debit Cards for Mayfield, Graves County and Trigg County Schools. The Spirit Card works like a traditional debit card and for each signature based transaction (not using your PIN), FNB donates $0.10 to the corresponding school. The tracking process is hassle free for the card holder, as FNB does all the tracking and submits the check to each school on a quarterly basis. The donated funds are utilized at the school’s discretion. 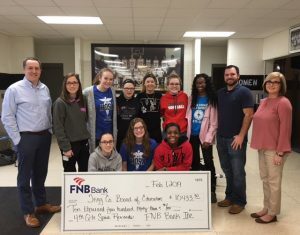 In 2017, FNB donated over $55,000 to their participating schools through the Spirit Debit Card Program. To learn more about the Spirit Debit Card Program, stop by your nearest FNB Office or visit www.GrowWithFNB.com.